Wanna see & smell how learning and playing belong together? Wanna be the first to hold the fresh playingCLIL handbook in your hands? Do you wanna meet and discuss with Do Coyle? 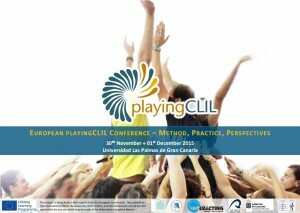 Use your chance to join our European playingCLIL conference by the end of 2015. For more information about the programme please download the conference flyer! To register directly please follow this link! My name is Carmen Felipe and I would like to attend the European playing CLIL conference. Thank you. Thanks in advance. We are looking forward to meet you in Las Palmas.